This is a favorite place to stay in Kirkwood with a garage close to the slopes! The views from this townhome are worthy of a postcard—enjoy the “wall of glass" windows that look across Kirkwood Meadow and onward to Red Cliffs, unlike most condo's that face the street. The roomy, open plan living room is ideal for a small group or two to three couples looking to socialize and entertain. Even though this condo only sleeps 6, there is a ton of room! This is because there are multiple levels to separate the spaces. Whether you want to enjoy nature from inside by the big windows or take it all in from the large patio, this is the perfect place to do it. The second floor master suite is equipped with a king, and the guest room sleeps two on one queen. A second full bath ensures everyone has space to prepare for their day as well as clean up after skiing. A Serta Air mattress sofa bed and half bath off of the living room offers extra guests a comfy spot to rest for the night. The nice thing about this condo is it sits back from the busy street and has meadow views. It also has a garage which is a huge plus and a rarity in Kirkwood. This condo also has a nice cabin feel with it's wood trim and wood vaulted ceilings. 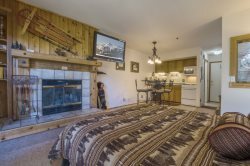 The location of this condo is a 5 minute walk to the lodge and chairs 5 & 6. There is always the shuttle which runs all day long if walking is not an option. If you love Kirkwood but want to avoid the noise from the restaurants and snow control bombs that frequently go off, this is a great option. Lost Cabin Townhomes are finished with rustic log and stone accents and offer expansive views of Kirkwood Meadow and Red Cliffs—a true combination of a cozy home atmosphere and a beautiful mountain setting. Each residence has been designed with space in mind, making the most of the open concept living areas and maintaining privacy in the bedroom layout. These townhomes are nestled in the Kirkwood Meadow just a few steps from horseback riding, hiking/biking and cross country/snow shoeing trails. You’re just a short walk away from five chair lifts as well as the restaurants, retail shops, and other amenities in the Village Plaza. Each townhome has a private 1 car garage and extra outdoor parking for guests. These residences were designed with style and taste in mind for the refined traveler. - Guest Bedroom - Queen Bed. - Living Room - Queen Sofa Bed (Serta Air Mattress). 2.5 Bathrooms - We provide towels, soap, shampoo, conditioner and hairdryer. Full Kitchen with the following amenities- dining table seating for 6, bar seating for 2, dishwasher, gas stove, microwave, coffee maker, basic pots and pans, dishes and silverware. 35" flat screen TV with Cable, VCR and DVD. 2 decks - Gas grill. 1 car garage and 1 outdoor parking space. I called the reservations office to make our reservation over the phone, since it was a last-minute reservation and since we were hoping to stay for a few nights less than the minimum night stay requirement. The people I spoke with in reservations were friendly, helpful, and accommodating. We had a wonderful stay in Lost Cabin 2. We were in Kirkwood for the Open House at The Hideout, wedding venue. We found our 2-bedroom condo very comfortable and exactly as advertised. We were also taken on a tour of other Pyramid Properties by a knowledgeable member of their team to view possible home for our upcoming wedding at The Hideout next year. We very much appreciated this and look forward to booking our next rental with Pyramid, as well as including it on our suggested list for lodging choices for our guests. Another great stay in Lost Cabin 2. Beautiful location next to slopes and meadow. Always clean and comfortable. Mother Nature treated us to several powder days! We will return! Most knives in LC2 are quite dull, so hard to chop / cut / prepare food in the otherwise very nice kitchen. Also missing a spatula. We thoroughly enjoyed our stay at Lost Cabin #2. The place was perfect for our family of five. We loved that we could walk out the front to the slopes and out the back to the meadow. Also the garage was a plus as well. And, the snow was amazing! Nicole was very helpful with helping us choose the right condo. Location was great and condo was clean and spacious. We loved staying in Kirkwood and our place was so close to the resort we could come back for lunch. Pyramid does a great job managing this property!